In this episode I am delighted to be speaking to Angela George & Laura Partridge, two of the wonderful physio's who look after us at tournaments and also work closely with the GB teams. 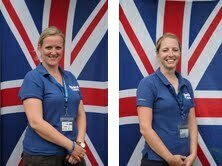 ----more---- Laura and Angela are part of the outstanding medical team that Georgie Windborn has built to support GB Ultimate and, increasingly, the UK domestic tournaments too. There were both introduced to Ultimate two years ago and have a huge amount of experience working with other sports. In this podcast we talk about the differences and similarities between Ultimate and other sports, the most common types of injuries they see in Ultimate and much, much more! Is there anything you wish we had covered in this podcast? A question I should have asked or something you want to hear more about? Let me know by commenting below or emailing host@utalkraw.com. Or you can find us on Twitter: @utalkraw. This podcast ends with the song "Moles" by Cape Canaveral, available under a Creative Commons Attribution-Noncommercial license.